Matthew Schaffer is a first-year master’s candidate studying Security Policy Studies, with a concentration in Transnational Security. He received a Bachelor of Arts in International Relations and Foreign Policy at Gonzaga University, including a term at American University in DC with the Washington Semester Program and a term at the University of Salamanca in Spain. Additionally, he was selected by Gonzaga to represent the University for the 58th Air Force Academy National Security Assembly in 2017. Previously, Matthew interned on Capitol Hill with the House Republican Conference, tutored Arabic speaking international students, and taught US national security to high schoolers from all over the country. He currently interns at Counterpart International as a program assistant. After finishing his education, he is aiming to join the United States Air Force as an intelligence officer and eventually join one of the intelligence agencies later on. When did you realize you wanted an international career? I wanted a career in international affairs since I was very young. I grew up as an Air Force brat and constantly heard about the stories from my dad about being deployed across the globe and meeting people from different cultural backgrounds. When I was a high school senior, I spent most of my free time reading up on international affairs instead of watching Gonzaga University basketball. It led me to be one of the few people in my global governance course that could clearly explain the stability issues within the Middle East since 1979 and how it pertained to US national security at home and abroad. 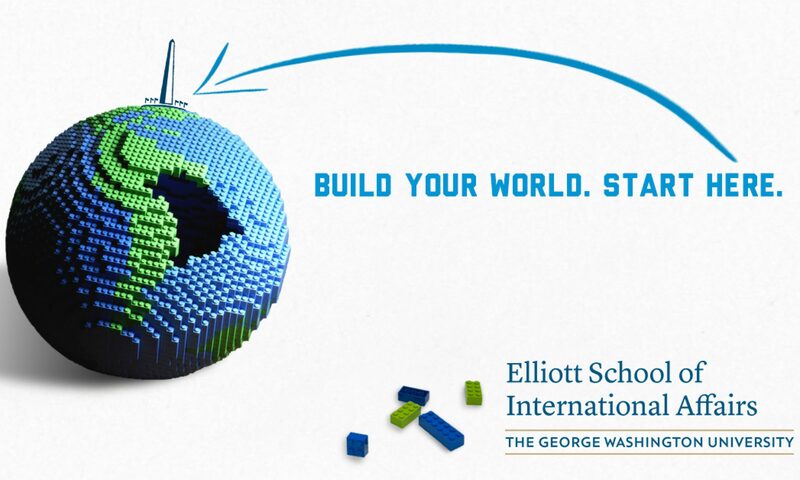 For me, that pursuit of working in the international realm has always been a goal and attending GW at the Elliott School has only strengthened my desire to do so. Where do you currently volunteer, and how does it fit in with your career goals? I currently volunteer with the Hugh O’Brian Youth Leadership Program (HOBY) as a facilitator in Idaho and Connecticut. In volunteering for this organization, I am teaching students what it means to be a civil servant within their own communities and in the larger global community as well. I am also taking time to learn about how I can be my own leader on the global stage, and how my actions can inspire others to make a difference and be the change this world needs through the personal, group, and societal leadership skills. What tools/strategies have proved most helpful in making the most of your time at the Elliott School? What advice do you have for students for staying motivated at work or in class? Take time to relax and do something fun. The coursework as a graduate student can be tough and draining after a while, and speaking from experience, makes it hard to feel motivated to get it done. Taking at least an hour to do something outside of studying will do you wonders. It can be anything from watching any sports game that is on at the time, taking a walk along the national mall, chatting with friends at a local coffee shop, or catching up on an episode of your favorite show. Taking time to unwind and shut your brain off for a short bit will help motivate you drive you to continue with your work. Favorite place to unwind on the weekend? When the weather is nice, it’s the National Cathedral campus up in Tenleytown. They have a lacrosse field up there where I can go and play for a few hours and a cafe that has a perfect view of both the cathedral and the garden around it. Wardah Amir is currently pursuing an M.A. in Security Policy Studies from the Elliott School with a concentration in Weapons of Mass Destruction. She is a Young Ambassador with the Women of Color Advancing Peace and Security (WCAPS) and is Co-chair of the WCAPS CBRN (Chemical, Biological, Radiological, and Nuclear) Working Group. She is a Project Associate with the Chemical Security team at CRDF Global. After performing an internship with the Organisation for the Prohibition of Chemical Weapons in The Hague, Wardah became extremely interested in Weapons of Mass Destruction policy. She has also performed internships with several think tanks including Chatham House, Hudson Institute, and the Center for Strategic & International Studies. Wardah holds a B.S. in Chemical Engineering from Texas A&M University. What has been your favorite experience at the Elliott School so far and why? My personal favorite Elliott School experience has been meeting other students, who I now get to call friends. We share a passion for contributing to this world in one way or the other, and we will continue to support each other through our established friendship, thanks to the Elliott School. Most courses I have taken at the Elliott School have been very useful to the progression of my understanding of security issues that I am interested in pursuing solutions to in the form of a career. However, I would like to highlight the exceptional skills courses the Elliott School has made available to its students. These one-credit courses are very applicable in the real world. Whether it be a writing class or a class on formal briefing, these courses made me more conscious of how I can improve my professional skills as I navigate Washington on a daily basis. Thanks to the skills course on writing for international policymakers, an op-ed I originally wrote for a class was published in the Bulletin of the Atomic Scientists. What resources (online or offline) or strategies have proven to be the most valuable in helping you reach academic success at the Elliott School? If you are a student at the Elliott School, the Gelman Library will certainly be a valuable resource to you. Another valuable resource was the ability to take courses through the consortium in other schools in the area. I have taken a total of three classes at George Mason University through this resource with their Biodefense program. The courses I have taken there have tied very neatly into my Weapons of Mass Destruction concentration and fulfills my objective of going through the Security Policy Studies program at the Elliott School. What advice do you have for prospective students who are on the fence about applying to a graduate program at the Elliott school? Here is some honest advice if you are on the fence about applying. Don’t apply till you are absolutely certain that this is what you want to do. But don’t be too careful that you miss out on opportunities. Take calculated risks. When I joined the Elliott School, I was an unemployed full-time student. By my second semester, I was a research intern at CSIS PONI. By my third semester, I was a full-time project associate at CRDF Global. My time at the Elliott School has been like riding a professional escalator. What city outside of the U.S. should people visit and why? Visit a place that you have never been to. Visit a place which is outside of your comfortable territory. Visit a place that you want to discover. Traveling is an opportunity to expand your knowledge of people, places, and cultures that are different from your own. With an open mind, put yourself in a place you have never imagined being. If you haven’t been here already, I would recommend that if you ever get the opportunity, you should visit the bustling city of Lahore. In the province of Punjab in Pakistan, Lahore is rich in culture. The most delicious and spiciest food I have eaten, the most beautiful and intricate clothes I have bought, the most extravagant and fun weddings I have attended, and the most driven and smartest people I have met – all in the city of Lahore. Siaka Togola is an M.A. International Affairs student concentrating on Economic Development in Africa. He is from Mali in West Africa and serves as the 2019 Elliott School Graduate Student Forum President. Currently, he is the Special Assistant to the African Union Permanent Representative to the U.S. on all diaspora related matters under the African Union Citizens and Diaspora Directorate (CIDO). Additionally, he chairs the Pan-African Diaspora Youth Association’s Communications and Public Relations sector, PADYA. PADYA is the Youth mobilization and sensitization branch of the African Union Mission to the United States of America, Canada, South and Latin America, and the Caribbean. He is an aspiring diplomat and international affairs practitioner and dreams to bring prosperity to Africa and its people. What inspired you to select your program/concentration at the Elliott School? It is my belief that Africa’s road to development is through cohesion among African nations. It is also my belief that the answer to making such cohesion happen can only be found at the Continental Level, rather than the country level. My desire to deepen my knowledge in international affairs and wanting to bring concrete and measurable change to Africa are the primary reasons behind my choosing a master’s in international affairs with a concentration on Economic Development. My regional concentration in Africa as a whole because I do not see the need to focus on a single country or region when trying to make the case for a continent to come together if only economically. What has been your favorite course at the Elliott School so far and why? I have liked every course I have taken so far at the Elliott School. The same goes for my teachers as they exhibit such deep knowledge of their subject matter and truly master their topics. I would say however that the most rewarding course so far has been my International Development Policy class. It has helped me examine the scope and nature of international development and the challenges currently facing development agencies, but also those that have arisen over the years. It is my hope that I can bring truly forward-looking answers to Africa’s developmental issues, for it truly is the Continent of the Century. What has been your most rewarding work, intern, or volunteer experience since starting your program at the Elliott School? My most rewarding work experience since starting at the Elliott School has been as Special Assistant to the African Union Ambassador to the US, H.E. Dr. Arikana Chihombori-Quao. I have been able to meet people from all over Africa and the diaspora, and some of these encounters were truly touching and life-altering. The African Union Mission here in the US has a core function to coordinate African Positions in efforts to mobilize support for Africa’s development and to adopt common positions on key issues; Build, Sustain and Nurture the Bilateral Relationship between the USA and the African Union; Inform America and Promote Africa; To establish working relationships with the World Bank Group, the International Monetary Fund, and the Organization of American States; Build Constituencies for Africa – Diaspora engagement. My role is to reach out, sensitize and coordinate efforts between the African Union and the African Diaspora, or as the African Union calls them, the sixth region of Africa (in addition to North, South, Central, East and West Africa, the 5 traditional regions). I do so primarily by putting together databases identifying diaspora and diaspora organizations within the sixth region. Five years from now, I hope I would have grown into a career in International Development with either my current employer or with a multilateral development bringing and promoting Economic development in Africa. Change the world’s view of Africa and help make the case that an emerging and strong Africa is best for everyone, especially the United States. What advice do you have for first-year students who are starting their graduate studies? Whether you are a graduate or undergraduate student, my advice to you is to be involved in campus life and create yourself a strong network and support group. During my time at GWU, I have learned just how valuable such network and support is not only for your life in school but also for post-graduation. I don’t eat fruits mixed with “food”. To me, fruits are either snacks or dessert, so understandably my feeling about pineapple pizza is somewhat mixed? I do appreciate Pineapple as fruit and more so as a drink. I make the tastiest pineapple mojitos in the whole world if I say so myself. On occasion, I have had food served inside of a freshly cut and emptied pineapple. I cannot say that I tasted the pineapple, which is probably why I could finish that dish. John Mackedon is an Online Communications Officer with the World Bank, working in the Europe and Central Asia region. John joined the World Bank in 2009 and has worked in gender, agriculture, climate change, and communications. Prior to going to the Elliott School to pursue a degree in European and Eurasian Studies, John lived and worked in the former Soviet Republic of Georgia. From 2002 – 2004, John served as a Peace Corps Volunteer teaching English. Upon completion of his service, and in the wake of Georgia’s Rose Revolution, John moved to the capital, Tbilisi, to work as a journalist and development consultant. John was born and raised in northern Nevada and received his BA in English from the University of Oregon. When not exploring the nearby waters with his flyrod, John can be found sampling hoppy beers at a local brewery or brewing his own (hoppy) beer. Describe your current position and what are your primary responsibilities? At present, I am an Online Communications Officer for the Europe and Central Asia region of the World Bank. I cover communication activities for 11 countries around Central Europe, the Western Balkans, and Turkey – meaning my team and I are responsible for all of the external communications coming out of these countries, from information on our country websites to media relations, to risk management, and everything in between. I wouldn’t say there is a typical day in my job. One day I could be writing a feature story on pepper farmers in Montenegro and the next day I could be working with a reporter covering the latest economic trends in Poland. I work closely with my counterparts in the country offices this is my favorite facet of the job. Working with my colleagues across the region keeps me connected – and traveling and working on the ground in these places is a big perk for me. My counterparts definitely have their fingers on the pulse – not just about development, but across the entire political and socio-economic landscapes of their respective countries. Having the opportunity to work and better understand this part of the world – from the Western Balkans to the newest members of the EU – makes my job both a challenge and a real pleasure. What do you wish other people knew about your organization? The World Bank is an incredibly intricate and diverse organization. I think a lot of people assume that there are just a bunch of economists walking these halls, which is not entirely accurate. Don’t get me wrong – we have plenty of economists, but we also have a bunch of sociologists, and public health professionals, and journalists, and energy specialists and others. There is space for a wide variety of skills. We also have people from nearly every country on earth working here, which is amazing. I never grow tired of hearing Finnish or Georgian on any given elevator ride. This environment is very conducive to thinking differently and challenging assumptions, which is a key ingredient for doing development well. My approach to development, or even just my everyday work life, is positively influenced by the international nature of this organization. There aren’t very many Americans at the World Bank – and that can be very refreshing, actually. It’s also huge! We have more than 10,000 people in 120 offices around the globe. I hail from a small community in Nevada, so I am always humbled to remember that more people work in my building than living in my home town! What Elliott School courses would you recommend for students interested in your field and why? One class that always stands out in my memory was on international organizations, taught by Martha Finnemore. If you have the opportunity to take a course with her – any course – I highly recommend it. The one I took was one of the most interesting and well-taught classes I have ever been in. It forced the students to really learn about a number of international organizations (including the World Bank). I remember doing a paper on NATO and being so fascinated by the history of an organization that I had kind of taken for granted. Being forced to realize that these large, imposing institutions – like NATO or the UN – didn’t spontaneously spring from nowhere, that they were conceived by people who were trying to solve a very difficult problem, gave me a lot of inspiration. Grand ideas can come to fruition and new approaches to problems on a global scale are actually possible if the political will exists. More generally, I think that any class that interests a person is worth exploring. While the subject matter is clearly important, I think the less obvious elements of my course work at the Elliott School have served me even more in my professional life. Dealing with the dynamics of a study group, synthesizing massive amounts of information into a digestible product, building confidence to have an open and honest interaction with a professor – these are the skills I draw on every day at work. What was your experience with the job search post-graduation? Can you provide any wisdom for students starting their job search? In a word: brutal. I started looking for work while I was still finishing my degree and it was literally the day Lehman Brothers collapsed – setting in motion the global financial crisis. The federal government was in the middle of a hiring freeze until after the 2008 Presidential election, so there were not many places to even look for work, let alone become a new hire! I got so desperate that I started working with a temp agency, which is how I actually landed at the World Bank. My first job was answering phones and my second assignment was just replying to emails for a conference. This wasn’t exactly what I was hoping for when I decided to pursue a Master’s degree. That second gig was key, though – I kept completing tasks and asking my manager for more complex ones. I tried to get myself involved in enough areas that I would become the institutional memory for this conference and they would be forced to keep me – at least until the conference ended – and maybe find a more interesting role for me. That was 10 years ago. So, I guess my advice would be, become desperate! Just kidding. My advice is that any job can be an opportunity. Employers value diverse skills and they don’t always know exactly what they are looking for or what they actually need. In my case, I proved to my boss that she needed someone with communication skills to overcome some of the challenges of her program and she eventually gave me a fulltime job. Take the job you get and parlay it into the job you want. I would by our dog, Leyla. With a fulltime position as a professional cheese taster and a side gig as a napping consultant, she has figured out the true meaning of existence! The #ElliottProud series highlights Elliott School MA alumni and seeks to answer common questions posed by prospective, current, and incoming students. The views expressed by alumni profiled do not necessarily represent those of organizations they work for, are affiliated with, or the Elliott School of International Affairs. For more information or to submit questions, e-mail esiagrad@gwu.edu. Yagiz Sullu is a first-year graduate student at the Elliott School of International Affairs majoring in international affairs with a focus on development and the region of Europe/Eurasia. He finished his undergraduate education at Boston University’s Frederick S. Pardee School of Global Studies majoring in International Relations with a focus on Foreign Policy, Security Studies, and Europe. He is currently interning at the Washington Institute for the Near East Policy as a research assistant intern and conducting research and policy analysis on Turkish Foreign policy. His primary research interests are Turkish and Russian politics, NATO’s security issues and international business. He likes to meet people from different cultures and willing to visit all the countries in Europe one day. As I started observing the political events in my country and how the government interacted with the international community I decided to pursue an international career to represent my country and interact with people from many nationalities to hear their diverse thoughts and ideas. As I started building my career, I had a chance to meet many people from different countries and their experiences made me realize an issue in one country has an effect on the vast majority of countries. This lead me to engage in global affairs to delve into these issues to make a contribution to the peace and prosperity of the international community. I currently intern at the Washington Institute for the Near East Policy as a research assistant intern in the Turkish Research Program. Working here is an excellent opportunity for me to represent Turkey and contribute to research and policy-making on Turkey’s relations with the U.S and the Middle East. As I conduct research about Turkish foreign policy, I’m gaining more experience in negotiation and diplomacy. I believe internship experience here would better prepare me for a career in an international organization representing my country. Getting involved is the most helpful strategy to make the most of your time at the Elliott School. Career Café networking events and professional panels are really useful to build strong networks and hear different perspectives about particular international issues. As all students are pursuing international relations based careers in here, getting involved in many events would prosper key communication skills and build a strong vision. Thinking of how the Elliott School is dedicated to building leaders for the world is what students should think of as they are getting a world-class education in such a reputable institution. They are getting ready for particular global challenges and preparing to tackle them successfully to make a difference. Georgetown waterfront, watching the Potomac River and drinking coffee. Aditi Seth works as an Energy Market Analyst at ICF Technologies. She holds an M.A in International Science and Technology Policy with a concentration in Energy and Environment Policy from the George Washington University. She also holds a B.S in Mechanical Engineering with a minor in Economics from Shiv Nadar University in India. Prior to pursuing graduate school, she worked as a thermal engineer for a year and a half in India. During her time at the Elliott School, she worked as a research assistant at the Institute of International Science and Technology Policy focusing on climate and energy policy and as a consultant with the Climate Technology Program at the World Bank. I was always interested in energy and environment (my area of interest/concentration) from a young age. Having pursued a bachelor’s degree in Mechanical Engineering, I felt only having the technical skills was not enough. I needed to know where engineers like me fit in the world of policy, which led me to pick the Elliott School for my graduate studies. Energy and environment is one field that is highly dependent on international relations. Be it a decision to subsidize oil and petroleum or be it a decision to invest more in renewable technologies; it all stems from policy decisions taken by respective governments as well as international treaties. I am currently working as an Energy Market Analyst at ICF Technologies. In my day to day work, I perform quantitative and economic analyses of energy markets in the United States to assess and forecast electric power and fuel prices; including individual power plant performance, operation, valuation, and fuel consumption given the federal and national energy policies and other regulatory effects. The ISTP program gave me the freedom to choose my concentration and tailor my own education. This included being able to take classes offered by other schools at GWU!! I not only focused on energy and environment policy classes but also on quantitative skills I needed to pursue a career in this field. I did some subject matter classes from the Elliott School along with quantitative skills classes that ranged from advanced econometrics using R and STATA to environmental economics offered by other schools. This really helped me specialize in and acquire the skillset I needed to prepare for my current position. What advice do you have for prospective students who are interested in pursuing a graduate degree in international relations? My advice would be to do your research know what you want out of this degree. Given the wide range of classes offered at GWU, it is easy to get confused when picking your electives! Be focused and choose the classes that will add the most value to you in terms of knowledge and skills. Mohammed Abu Dalhoum is a Researcher and Analyst at NAMA Strategic Intelligence Solutions. He is interested in conflict resolution and explored a number of approaches to conflict resolution including the developmental pathway, reconciliation, diplomacy, and peace. Previously, Mohammed worked with a team of 3 Middle Eastern researchers on developing a synthesis report of the review of national youth strategies of Jordan, Palestine, Kuwait, Lebanon, and Morocco tacking various topics such as unemployment, education, health, social cohesion, and gender mainstreaming as well as providing recommendations as to how to mitigate such issues. He holds a bachelor’s in International Studies from Washington College and currently is pursuing his master’s degree in Middle East Studies at the Elliott School of International Affairs. What’s on your bucket list when you get to DC? I want to use this great opportunity to expand my connections and enhance my experience by working at one of the leading research centers in the capital. Is there anything about moving to DC/starting grad school that you’re nervous about? I think working full time and studying full time might be challenging for me, but I always like challenges because they test us to the limit and make the outcomes more rewarding. What are you looking forward to about starting your MA program? When I graduated from college, I set a goal for myself that I wanted to work for two years then come back to pursue a master’s degree at one of the world’s top universities. I think my plan is on the right track now. I look forward to learning more and more every day at Elliott. I am looking forward to every lecture more than I ever had in the past. The moment I took my first class here, I know this was the perfect place for me. I do not think I have ever been happier about a decision in my life the way I feel about studying at ESIA. I would not personally eat it. I do love pineapple but prefer it cold. Either way, my undergraduate university once served pizza with M&Ms on it, so I think pineapple is somewhat normal compared to that!